1. Marinate chicken pieces with ingredients numbered 2. 2. Crush ingredients numbered 3 very well with your fingers. Add coconut oil, chilly powder, slit green chilies and marinated chicken. Combine well. 3. Cook the chicken covered adding 2 – 3 tbsp water (or coconut milk, for extra taste), stirring occasionally until chicken is 3/4 th done and most of the moisture evaporates. Add sliced tomato and mix well. Again cook covered over low flame until the chicken pieces are completely done and coated well with the masala. Switch off the flame. 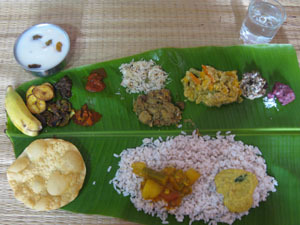 Serve with rice / chapathi. Hello Maya: Would you give me the approx times for the cooking segments you describe for the chicken dish: (1) ‘… until 3/4 th done’ (2) “until chicken pieces are completely done.” I refer to stove-top cooking. Thanks, Dido. Chicken will take around 25 – 40 minutes depending on the type, size and flame to be completely cooked..